The jacaranda blossoms are mostly off the tree in the front of the house. 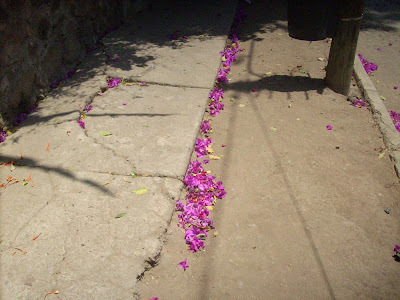 Now, we have bugambilia petals strewn everywhere. The plant is commonly called buganvilia elsewhere and has various names in the Spanish speaking world. I don't mind sweeping up these flowers -- "it's all good."